One of my very worst peeves is when I make kitchen plans and for whatever reason, they fall through. But we’re not gonna focus on those tiny missteps, guys. The main takeaway here is that usually, I can fix it. Usually I can think quick on my feet, adapt and still get what I want out of a dish. Case in point would be today’s recipe. Alright so, boom. It’s summer time, and I really wanted to make chicken skewers. I didn’t have any wooden skewers in the house and I still haven’t gotten around to buying the metal set I have bookmarked on my Amazon wishlist. But I didn’t figure that was too big of a deal. Since it is summer, and people tend to enjoy grilling kebabs during the summer, I thought that I’d most likely be able to find a pack of wooden skewers just about anywhere, right? Yeah, no store I went to had wooden skewers. I mean, none. How rude. The real gag was, I had already started the prep work for this recipe. I was so confident I was going to find the skewers, that my marinade was already done and put together, AND the chicken was already cut into the cubes for the skewers and soaking in it, ready to be skewed. Were my initial plans foiled? Yeah. Was I annoyed? Most definitely. Did I give up? Tuh. You guys know who this is. I wanted chicken skewers. True, I wasn’t going to get the skewers part of that equation…but there was no way I wasn’t still going to have chicken. This was one of those times where I knew that I could make it work. So right off rip, I’ll let you guys know that this is a dish with primarily Asian flavors. The marinade itself has that pungent, salty flavor from the fish & soy sauce, but ti’s well balanced out with the OJ and brown sugar that lend sweetness, and the ginger that gives it a bite. Once that flavor is given time to develop in the protein, you can move onto the really good part, which is the sauce. The sauce is where the ‘caramelization’ in the recipe title comes in; it’s tangy, sweet, and slightly thick. When it’s brushed onto the chicken in the final stages of cooking at a high temp, the sugars in it form a thin crisp, slightly blackened layer on top of the chicken that deepens the flavor and makes the sauce sticky. I didn’t have my wooden skewers. My plans were thrown off. And I still walked away with this dish, which by the time all was said and done made me forget that I was upset about it in the first place. It was easy to ‘make it work’. In the recipe below I do give instructions for how to cook the chicken with and without skewers just in case the grocery stores in your area want to be rude like mine were and act like this isn’t prime grilling season. Whether you choose to make it over a grill, under a broiler or in a skillet or wok, I think you should try this dish. It’s quite good and has become another addition to my collection of Happy Accidents. Linking this up to Fiesta Friday #187, co-hosted this week by Judi @ cookingwithauntjuju.com and Sadhna @ Herbs, Spices and Tradition. 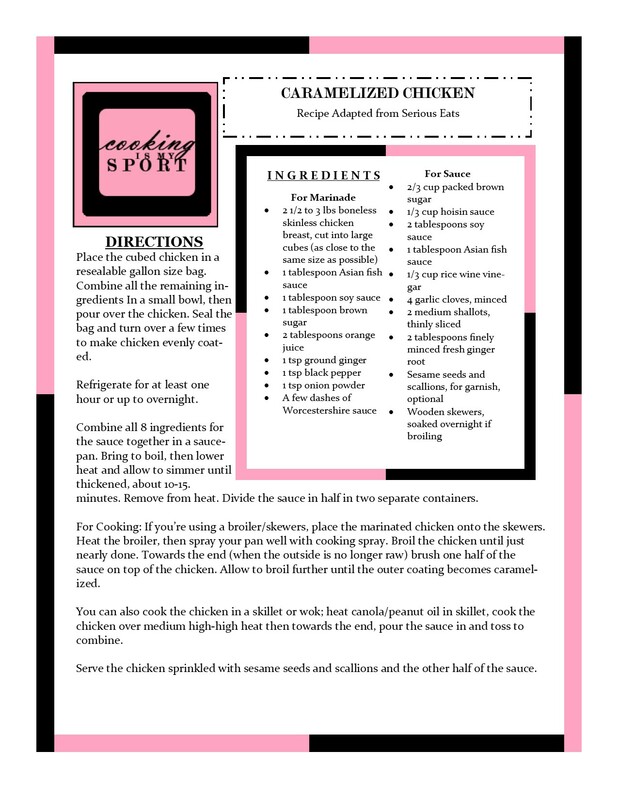 Place the cubed chicken in a resealable gallon size bag. Combine all the remaining ingredients In a small bowl, then pour over the chicken. Seal the bag and turn over a few times to make chicken evenly coated. Refrigerate for at least one hour or up to overnight. Combine all 8 ingredients for the sauce together in a saucepan. Bring to boil, then lower heat and allow to simmer until thickened, about 10-15. minutes. Remove from heat. Divide the sauce in half in two separate containers. For Cooking: If you’re using a broiler/skewers, place the marinated chicken onto the skewers. Heat the broiler, then spray your pan well with cooking spray. Broil the chicken until just nearly done. Towards the end (when the outside is no longer raw) brush one half of the sauce on top of the chicken. Allow to broil further until the outer coating becomes caramelized. You can also cook the chicken in a skillet or wok; heat canola/peanut oil in skillet, cook the chicken over medium high-high heat then towards the end, pour the sauce in and toss to combine. Serve the chicken sprinkled with sesame seeds and scallions and the other half of the sauce. Thank you Elaine, so do I! I love cooking chicken like this! I have a lemongrass chicken recipe I use that is very similar to this and it is such a nice treat! I’ve always wanted to try lemongrass with chicken, since it is used so much in Asian cooking. Thank you Abbey! Looks yummy. If you are going to bring up kitchen disasters, I’ll share mine. I lit a smores pie on FIRE in my oven! It was ruined. Also, I have a stickless sheet pan beef kabob recipe on my blog for when there are no skewers and grill. Grill fires! Oh no! I would’ve been so sad; obviously about the fire, but probably even more so about the ruined food lol I’ll be sure to check out your beef kabob recipe as grills and I don’t get along. Thank you! Looks really tasty, thanks for sharing I better give it a try! I’ve had my metal skewers for a very long time and occasionally will use wood or rosemary stems. Hardware stores (like Ace) are a great store for grilling supplies. I would not think grocery stores would have them so I am not surprised. Love your chicken recipe as I grill 3-4 times a week and kebobs are the best way to cook – quick and easy. Thanks for sharing with Fiesta Friday and enjoy your weekend. Ahhh no skewers, already!! But this looks so good, skewers, no skewers, no one would mind anyway 😀 Love all the flavors, looks super delish! Thank you Freda. The chicken was good enough to make me not even miss not having the skewers! I think I’d use chicken thighs for this one!! This looks so inviting!! Chicken thighs would work just as great here, thanks Jhuls! You have used nice spices and ingredients for this chicken, I am sure it is very tasty. Thanks for sharing it with Fiesta Friday. I’ve started adding a few dashes of fish sauce to a lot of my savory dishes. It adds a little special ‘something’ to the flavor profile. I just love it. Thank you!